You know what they say about large tablets - the specs have to match. That's exactly what we are thinking now that the Samsung Galaxy Note 12.2 is rumored to boast some of the most powerful tablet hardware available. The unconfirmed 12-inch tablet has apparently found enough room to pack in a speedy quad-core 2.3 GHz Snapdragon 800 processor and a healthy 3GB of RAM, reported Chinese-language benchmarking site AnTuTu. The unconfirmed Galaxy Note 12.2 is said to also include an 8-megapixel camera in the rear and 2-megapixel camera in the front. The total storage on the benchmarked device is said to be 32GB, though that could be just one of several configurations Samsung is planning. The larger-than-normal Galaxy Note 12.2 is said to have a screen resolution of 2560 x 1600, which is the same as the newly released Galaxy Note 10.1 2014 Edition. The reported Galaxy Note 12.2 tests indicated that the device is running Android 4.3 Jelly Bean, which is currently the latest version of Google's mobile operating system. 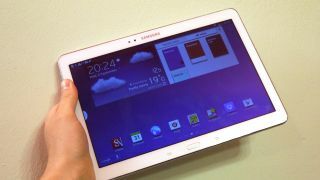 That out-of-the-box OS may be a little dated by the time Samsung launches its biggest tablet yet. Google is expected to announce the next version, Android 4.4 KitKat, tomorrow along with the Nexus 5. Of course, for all that benchmarks are worth, none of the tentative data can tell us when the South Korean company plans to release the Galaxy Note 12.2. The good news for display-deprived tablet lovers is that it seems to be only a matter of time before Samsung releases this 12-inch mega slate to the world. Want a matching mega-sized phone? Check out our Galaxy Note 3 review.